The Western Connection is one of Granby�s best kept secrets! 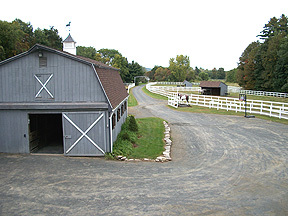 Our private stables are located on a quiet residential street at the end of a cul-de-sac. 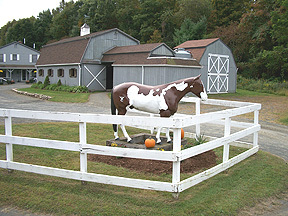 The Western Connection is nestled in amongst the beautiful rolling hills, meadows and orchards of picturesque and horse friendly Granby, Connecticut. Since 1992, the Western Connection has been quietly caring for pleasure and performance horses as well as their Western or English disciplined riders. Our family atmosphere welcomes adult and child horse enthusiasts. The managers� professional experience has ranged from prenatal mare and foal care to retirement horses and everything in between. Our beautifully landscaped facility offers a pleasant, relaxing and fun experience for boarding, or training, a 100 x 200ft. lighted sand ring, 60ft. round pen, grass pastures with large run-in sheds. For your added convenience there is a bright and spacious tack room as well as a clean climate controlled bathroom. 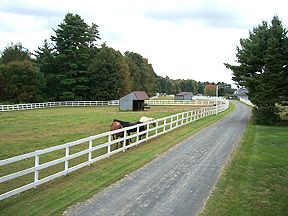 This 38 acre farm welcomes you and abuts to the McLean Game Refuge, Salmon Brook Park and Holcomb Farm for our active riding community.